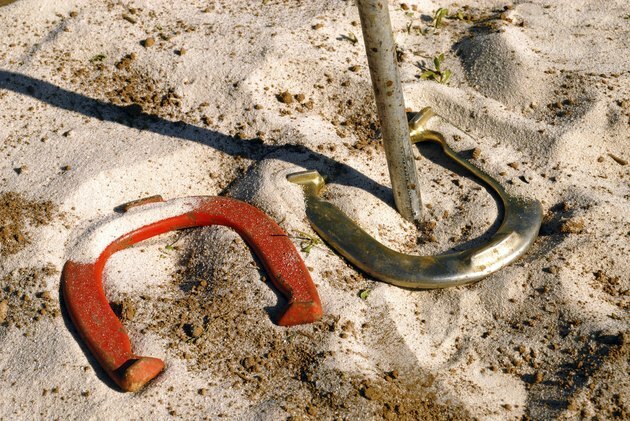 A horseshoe pitching court measures 50 feet long and 10 feet wide with the stakes placed 40 feet apart. Foul lines mark the closest a "pitcher", or contestant throwing horseshoes, can get to the stake. Foul lines exist at three points: 20 feet, 27 feet and 37 feet from the stake. The National Horseshoe Pitchers Association, or NHPA, has defined pitching divisions based on a player's age, gender and physical ability. The foul line used depends upon the player's division. Pitchers, male or female, under 9 years of age play in the Junior Cadets division. Pitchers in this division use the 20 foot foul line while pitchers under 18 in the Junior Boys or Junior Girls division throw from the 27 foot foul line. Junior Cadets, Junior Boys and Junior Girls may move up to the next division prior to age guidelines, but cannot return to the previous division once moved, according to NHPA rules. Open Men and Open Women divisions have no age restrictions. Men playing in the Open Men division must pitch from the 37 foot foul line while pitchers in the Open Women division use the 27 foot throwing distance. Male and female pitchers become eligible to play in the Senior division in the year that they turn 60 years old, although they can choose to remain in the Open Men or Open Women divisions. The rules on throwing distance remain the same as in the Open Men and Open Women divisions. Men, age 70 or older, may compete in the Elder Men division, if they purchase an NHPA card and the NHPA Convention approves the division change. Pitchers in the Elder Men division throw from the 27 foot foul line. According to NHPA rules, once a man moves to the Elder Men division, he must remain in that division for the remainder of the calendar year. Men under the age of 70 who have a physical impairment may get permission to pitch from the shorter distance in the Elder Men division. Physically challenged men must complete a Medical Exemption Form and be approved by the NHPA Convention to play in the Elder Men division.